The Annual General Meeting of both the Club and the Foundation took place on on Monday, December 10th. Romeo Girardi was awarded his 25-year Rotary pin. Foundation Fund Secretary Ron Arkell confirmed a quorum was present and recorded the minutes. The agenda, history and purpose of the Foundation was presented. A motion to approve amendments to the By-Laws of the Foundation Fund was approved, as well as the minutes of the AGM held December 11, 2017. Don Marsh, Chair, then gave his report on the goals and objectives for the coming year. Emma Bufton presented the Treasurer’s Report for the period of July 1, 2017 thru June 30, 2018. A motion was adopted to approve the Financial Statements. The Foundation Fund Board recommends to the members that the Foundation reappoint Roth Mosey as auditors. This was approved. A motion was approved accepting the actions of the Foundation Fund and its Directors. The AGM for both the Club and the Foundation Fund was held. David Eady, Secretary of the Club, presented the minutes of the December 11, 2017 AGM and a motion was adopted approving these minutes. David Eady was recognized for his work for 18 years as Club Secretary. David will be handing over the position to Sherrilynn Colley-Vegh as of July 1st. Randy Winters presented the Financial Statements for 2017-2018 and a motion was adopted accepting the Financial Statement as presented. A motion was approved accepting the actions of the Club and its Directors. Walter Willms ran Happy Bucks in the absence of Greg DeHetre. Ron Arkell gave a summary of the last Ghana trip. For a detailed report, please click here. Major Paul Rideout thanked the Club for their involvement with the kettles. This year, $461 dollars was raised at the Bright Lights city event. Tony Mancinone remembered his friend - a polio survivor. Rick Caron gave a Tunes for Tanzania recap - the event raised over $2700, enough to keep Eva, a Tanzanian women (not a bride) in pharmacy school. Janet Kelly spoke about the exceptional work going in in Ghana, good candidates were found after Vocational Training Team interviews took place. Sherrilynn Colley-Vegh wore the Socks and Bottoms hat for the last time this season! 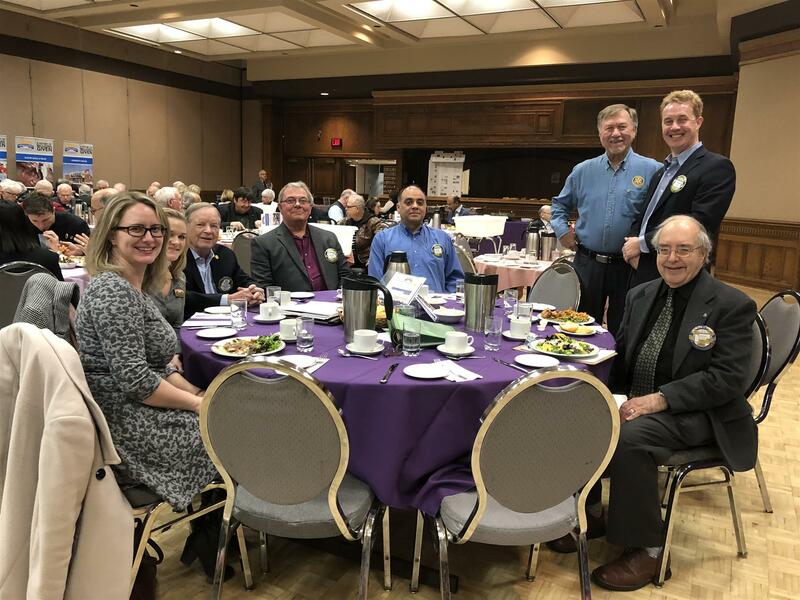 Anil Chitte was happy to announce that the Rotary Club of Windsor Free Day at the Museum had 386 visitors - huge, considering they only get around 50-60 people on a regular Saturday.